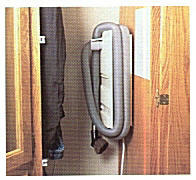 Enjoy the convenience of a built-in vacuum cleaner system that installs without pipes. It's only 3 7/8" deep, it fits easily inside any 2 x 4 wall or simply hang it inside a closet or cabinet. 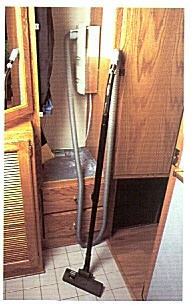 Just attach the hose to the outlet, turn the Vac on and glide the vacuum wand around the room, 30 feet in all directions. And thanks to the adjustable wand heights, you won't have the lower back strain you've likely been getting. When used with a 30-foot hose, each unit cleans an area up to 1,400* square feet. *May vary depending on individual floor plans.